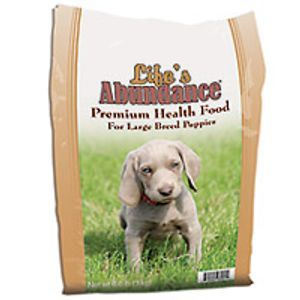 Life's Abundance Premium Dog Food, when delivered to your door, is freshly made and packaged. Aside from home cooking for your pet, our pet food and pet products are the freshest in the world, and SAFE too! Our mission is to help pets live a longer and healthier life! 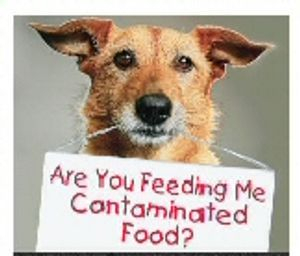 Life's Abundance pet food has NEVER been recalled. Why not feed your puppy the best! Holistic Premium Dog Food. Formulated by a holistic veterinarian. Risa's Goldens recommends Life's Abundance Large Breed Puppy food. Is Your Dog Food Killing Your Dog? Concerned about the pet food recalls? We are always saddened by the many calls and emails we receive from dog owners who have lost their precious Golden Retrievers to cancer. Why is cancer so prevalent? Pet owners are now becoming more knowledgeable because of the recent pet food recalls. Much evidence points to the fact that some ingredients contained in dog foods, even those found in the "best" brands, are known carcinogens and allergens. We invite you to click on the link below and see for yourself. You can also compare the dog food you have been feeding to the natural dog food we recommend for your dog or puppy's long, healthy life. Life's Abundance, when delivered to your door, is freshly made and packaged. Aside from home cooking for your pet, our pet food and pet products are the freshest in the world, and SAFE too! Our mission is to help pets live a longer and healthier life! Risa's Golden's Recommended Dog and Puppy Food. Give your puppy a healthy start for better health and longevity. Holistic formula. Never recalled. Life's Abundance dog food has NEVER been recalled! Life's Abundance is a healthy pet food company that has chosen to direct ship products to the public rather than through the pet stores. We do this on purpose. Our product formulator is a veterinarian by the name of Dr. Jane Bicks. She’s a holistic veterinarian and has 30 plus years of expertise in the pet food industry. Dr. Jane realized that most pet foods get spoiled and damaged by the fact that they are sold through stores. The industry average for pet foods to sit around is 6 to 12 months. We bypass pet food stores altogether and ship the freshest product in the industry right to people’s homes. Most people call and treat their dogs and cats like, children, but I guarantee they would never feed commercial pet foods to their actual children. When people discover our healthy dog and cat foods, treats, supplements and spa care products, they usually stick with them for life because they produce genuine results. In fact, 70% of our customers are on a regular auto shipment. In a nutshell, there’s really no other pet food that can come close to what we do. We’re not subject to the dictates of the mass market, so we can do whatever is necessary to provide a safe and healthy product. All of our ingredients are inspected by the Animal Plant Health Inspection Service (APHIS) and our food is shipped direct to you generally within 4 to 6 weeks of being made. We’ve been in business since 1999 and have never been recalled. I don’t know what you’re feeding now, but I strongly advise that you take a look at our dog and cat products and give them a try with your furbaby. View our complete dog and cat product line. One last note, if you love pets and you’re looking to build a rock solid business, we offer that option too. The pet industry is over 40 billion dollars, so the opportunity is incredible. Unlike any other pet food manufacturer, we let you keep your customers for life, with absolutely no inventory requirements. We’re creating a real revolution in the pet industry. That’s also why we attract so many pet professionals like groomers, breeders, pet sitters, dog boarding kennels, doggie day cares, etc. Pet professionals have been cut out of the market for years and yet they make product recommendations every day. Our business allows them to recommend healthy pet food profitably again. This is great for you, because when you're speaking to pet professionals, they have a built in clientele and you’ll earn from everything they sell too. You can earn up to 9 levels deep, and we have bonus pools that pay you on company profits nationwide. We also have all the training and tools anyone needs to be successful in this business with our amazing JumpStart training. We are a 17+ year old debt free, employee owned company with a world class product formulator behind us. Does this sound like something you’re looking for? View our Life's Abundance Business.